SEAN: The last week of February has far, far more titles than I expected. A ridiculous amount, given Yen was mostly the week before. Cross Infinite World debuts a new light novel with Beast † Blood (which seems to be part of a series called The Beast’s Mate). It’s got a Japanese author and title, but the premise seems pure Western YA. Biotech Researcher meets Mutant Beast Hunter. Sparks fly! Dark Horse has piled all their manga into next week. We get the debut of their “Deluxe Edition” of Berserk, as well as Fate/Zero 8, and I Am a Hero 9. ASH: From the previews I’ve seen, the deluxe edition of Berserk looks gorgeous. It also has a price tag to match. SEAN: Denpa Books has two debuts. 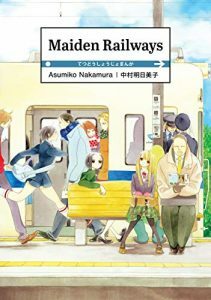 The first is Maiden Railways, a one-volume collection of short stories that involve romance on the train. It’s from Hakusensha’s Rakuen Le Paradis, which means it’s a must buy for me. ASH: I’m very happy to have more of Asumiko Nakamura’s work available in English! ANNA: I pre-ordered Maiden Railways, I am excited! MELINDA: This sounds so interesting! Sign me up! SEAN: They also have the first volume of Today’s Menu for the Emiya Family, which just had an anime run this past year. If you love Fate/Stay Night but wish there was less blood and death and more delicious food (it has recipes!) and heartwarming moments, this is the title for you. It runs in Kadokawa’s Young Ace Up. Guaranteed not to have people die when they are killed. ASH: I do like a good food manga, but I know almost nothing about Fate/Stay Night. SEAN: J-Novel Club gives us four new volumes, as we see Der Werwolf 3, How NOT to Summon a Demon Lord 7, Infinite Stratos 6, and Kokoro Connect 4. Kodansha, on the print side, has Clockwork Planet 10 and In/Spectre 9. 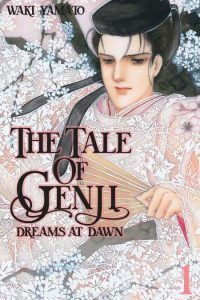 Digitally the big debut is The Tale of Genji: Dreams at Dawn. This classic shoujo series started its run (in Kodansha’a Mimi magazine, which no longer exists) in 1979, and is apparently a terrific adaptation of the classic story. The author, Waki Yamato, is not as revolutionary as the Year 24 group, but certainly made popular shoujo titles. Can’t wait to read this – the first three volumes are all out next week. MICHELLE: I am super excited for this. Stay tuned for an Off the Shelf feature! ASH: I’ve wanted to read this for such a long time! I really hope this truly is one of Kodansha’s “digital first” series and that we eventually get it in print, too. ANNA: I am also excited but would be more excited for a print release! MELINDA: I could not be more excited about this. I have a couple of volumes in Kodansha’s old bilingual edition (gifted to me by Kate, I think!) and they are lovely. But to have a real full-length English edition is a dream come true. You all know how much I love shoujo manga from this era, so my excitement can’t possibly be news. But I intend to shout about it all the same! SEAN: In non-Genji news, we see Ace of the Diamond 20, All-Rounder Meguru 9, Defying Kurosaki-kun 7, Kira-kun Today 4, Kounodori: Dr. Stork 10, Mikami-sensei’s Way of Love 3, and My Boyfriend in Orange 6. MICHELLE: Insert obligatory sports manga wooting. SEAN: I was hoping for a more Space Battleshippy sort of debut this week, but it’s been bumped to April. 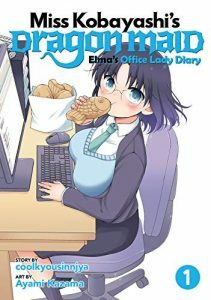 Instead, Seven Seas debuts Miss Kobayashi’s Dragon Maid: Elma’s Office Lady Diary. There’s also Alice & Zoroku 5, The Ancient Magus’ Bride 10, The 3rd Captain Harlock Classic Collection, Made in Abyss 5, Masamune-kun’s Revenge 9, and Pandora in the Crimson Shell: Ghost Urn 11. MICHELLE: I’m so looking forward to the new volume of The Ancient Magus’ Bride, as we left off with Chise preparing to get some learnin’. ASH: The Ancient Magus’ Bride is where my attention’s at, too. SEAN: Tokyopop may give me mixed feelings overall, but there’s no way I’m passing up another attempt (please let it be completed this time) at Aria, the gorgeous manga about gondoliers on Mars. The Masterpiece Collection’s first volume will contain the two-volume prequel Aqua. MICHELLE: Hm. Dubious face. I still have my old volumes of Aqua. It would’ve been nice if they’d started with Aria volume seven, but I guess that doesn’t make a ton of sense in terms of bringing in new customers even though it’d be a step toward making amends to the old customers. ANNA: I had a couple volumes of old Aria and it was beautiful but I think didn’t have a ton of narrative substance? I don’t remember, I didn’t stick with it long. MELINDA: I am skeptical but always full of hope. 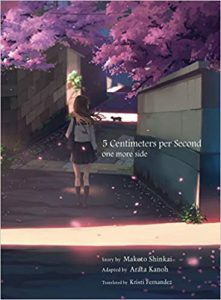 SEAN: Vertical Inc. has a one-volume novel, 5 Centimeters per Second: one more side. This tells the story from the point of view of the heroine. MELINDA: I am interested in this! Vertical Comics, meanwhile, has the 3rd volume of the compelling and also unnerving series My Boy. Yen has a couple of digital-only releases next week, as we get Corpse Princess 21 and IM: Great Priest Imhotep 11. Yen manga, meanwhile, gives us ACCA 6, Durarara!! re;Dollars 4, Hakumei & Mikochi 4. MICHELLE: I believe this is the final volume of ACCA, as well. ASH: Oh, I think you’re right! I’ve been thoroughly enjoy the series. ANNA: I still need to read it because I am terrible. SEAN: And last, but not least, we see a digital-only manga hit print with a giant done-in one omnibus. Shut-in Shoutarou Kominami Takes on the World is a Big Gangan series about a hikkikomori who’s trying to fix himself and the gag manga writer who hopes he doesn’t. It’s apparently quite funny. ASH: I’ll admit I’m curious. SEAN: See? It’s a lot? What are you getting? Sadly, probably nothing as i really need to start saving up for TCAF.